Contains advice from the bench, step-by-step procedures, practice-proven strategies, and 6,000 case citations. Considered by many to be the number one authority on the subject. 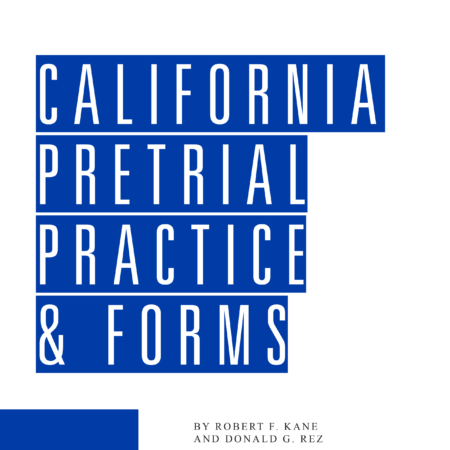 This renowned work features more than 6,000 case discussions and valuable advice from a leading authority in California workers’ compensation law. Since 1980, the late Judge Sheldon St. Clair’s California Workers’ Compensation Law & Practice has been the “go to” resource when tough questions arise. This edition keeps you up-to-date with 2 revamped chapters, statutory and rule changes, and hundreds of new cases updating all 24 chapters. Chapter 8 Permanent Disability: has been updated and reorganized to present the material in a more logical way. Much of the text has been completely re-written to enhance clarity. The discussion of liens and related topics previously covered in various chapters has been revised and consolidated in Chapter 10 Liens and Medical-Legal Cost Petitions. IMR: First District Court of Appeal affirms Board’s decision denying the applicant’s petition for the Board to order its IMR organization to disclose identities of first and second independent medical reviewers. David L. Pollak is a graduate of the University of California, Los Angeles, and Western State University, College of Law. He began his workers’ compensation career in 2000 as an associate attorney at the Law Offices of Finestone, Schumaker & Associates, a Southern California workers’ compensation firm representing injured workers. He subsequently worked beginning in 2004 as an associate attorney for the Law Offices of Adelson, Testan, Brundo, Novell & Jimenez, a national workers’ compensation firm representing employers, insurance companies and third party administrators. Since 2009, he has been a Workers’ Compensation Administrative Law Judge at the Van Nuys District Office of the WCAB. He has been a featured speaker for various educational seminars hosted by WorkCompCentral and was awarded its Judicial Officer of the Year for 2014. Judge Pollak has been a member of the LexisNexis® California WCAB Noteworthy Panel Decisions Advisory Board since 2011. Roger A. Tolman, Jr. is a graduate of the University of California, Los Angeles and the University of San Diego School of Law. He has been a workers’ compensation judge since June 2001 and works at the Los Angeles Office. Prior to that, he worked at Mastagni, Holstedt & Chiurazzi representing applicants including state workers, law enforcement personnel, and others. He has worked for both applicant and defense firms and has worked in both southern and northern California. He is also involved in continuing education of judges, especially in regards to use of the Division of Workers Compensation’s EAMS computer system. Daniel A. Dobrin is a graduate of Cowell College, the University of California, Santa Cruz, and University of California, Los Angeles School of Law. He began his workers’ compensation career in 1977 as a staff attorney with State Compensation Insurance Fund. During the 1980s, he worked as a criminal appellate attorney handling, among other matters, the defense of the “Billionaire Boys’ Club” case. He subsequently was an attorney and partner with Kegel, Tobin and Truce, a Southern California workers’ compensation defense firm. Since 2004, he has been a Workers’ Compensation Judge at the Los Angeles District Office of the WCAB. Judge Dobrin is a former member of the Pomona Cultural Arts Commission, and founder of the Pomona Film Festival. Richard L. Newman is a graduate of Antioch College and the University of California, Hastings College of Law. In September of 2011, he was appointed Chief Judge for the Division of Workers’ Compensation. Prior to working for the state, Mr. Newman worked as an attorney for the U.S. Department of Labor and in private practice, representing injured workers. In 1991, Mr. Newman began working as counsel to the Administrative Director of California Workers’ Compensation F-4 the Division of Workers’ Compensation. From 1995 to 2011, he worked as a Workers’ Compensation Judge in the San Francisco District Office, where he was appointed Presiding Judge in 2009. He has served on the board of the Conference of California Workers’ Compensation Judges and has served as an advisor to the Executive Committee of the Workers’ Compensation Section of the State Bar of California. Alexander Wong is a graduate of the University of California, San Diego, and University of California at Berkeley Boalt Hall School of Law. He is a certified specialist in Workers’ Compensation law. After working as a workers’ compensation defense attorney for the San Francisco City Attorney’s Office, he went into private practice as an applicant’s attorney and now is a partner at Jones, Clifford, Johnson, Dehner, Wong, Morrison, Sheppard and Bell. In 2001, he served as the chair of the Executive Committee of the Workers’ Compensation Section of the State Bar of California. He is the former chair of the San Francisco Democratic Party, and a former Regent of the University of California. Sheldon St. Clair graduated from Gettysburg College in 1952 and from the University of California Law School (Boalt Hall) in 1958. He served as law clerk to Justice Raymond E. Peters on the California Court of Appeal and Supreme Court from 1958 through 1959. In 1964, Mr. St. Clair was appointed associate counsel to the then Industrial Accident Commission, and in 1966 he was appointed Workers’ Compensation Judge of the Workers’ Compensation Appeals Board. Mr. St. Clair served as Deputy Commissioner of the WCAB in San Francisco from 1970 through 1974, and as a Workers’ Compensation Judge assigned to Van Nuys from 1974 through 1994, when he retired from state service. Mr. St. Clair passed away in October 2007.